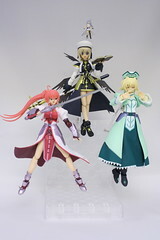 As usual for a figma from the Nanoha universe, Shamal comes chock full of goodies. First off, the usual stuff. 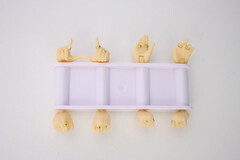 The figma 3 jointed stand and base are a given, as well as a set of hands. The hands are unique to Shamal however, as each hand has a set of Klarer Wind on each ring and pointer finger. Klarer Wind is Shamal’s device if you haven’t seen A’s or StrikerS. 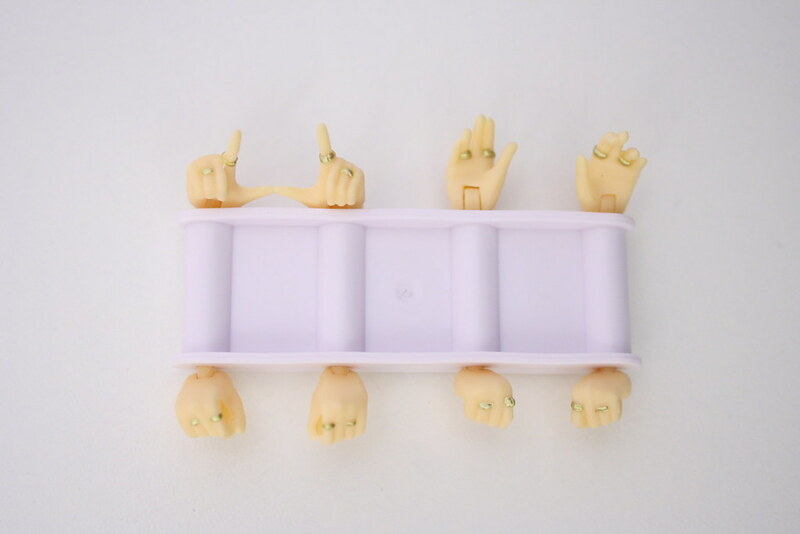 Other figmas have had unique hands, but this is the first figma to have any jewelry. Shamal even has hoop earrings on! Shamal also comes with her hat of course, a bonus face with her eyes closed, and a set of bangs facing the left. 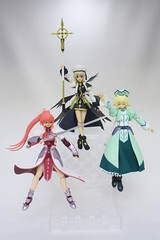 Also included are parts for the Yagami Hayate Knight Armor ver. 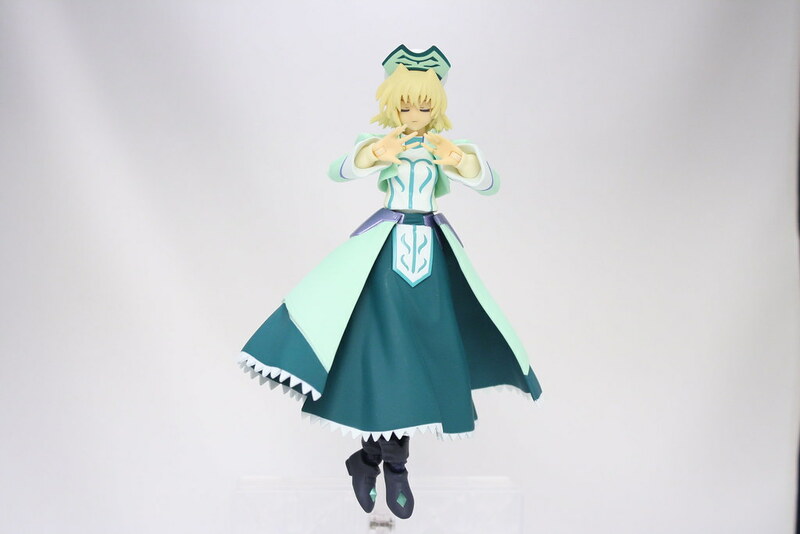 figma to transform her into Unison Hayate. Yagami Hayate has the special skill that allows her to combine with her Unison Device, Reinforce Zwei. When combined, her hair lightens and her eyes change color to a deep blue. I have also included a quick and dirty guide on how to attach Shamal’s hat. Part 1 is here, and Part 2 can be found here. 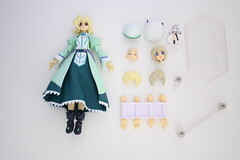 Pros: Shamal comes with a lot of stuff, as mentioned above. 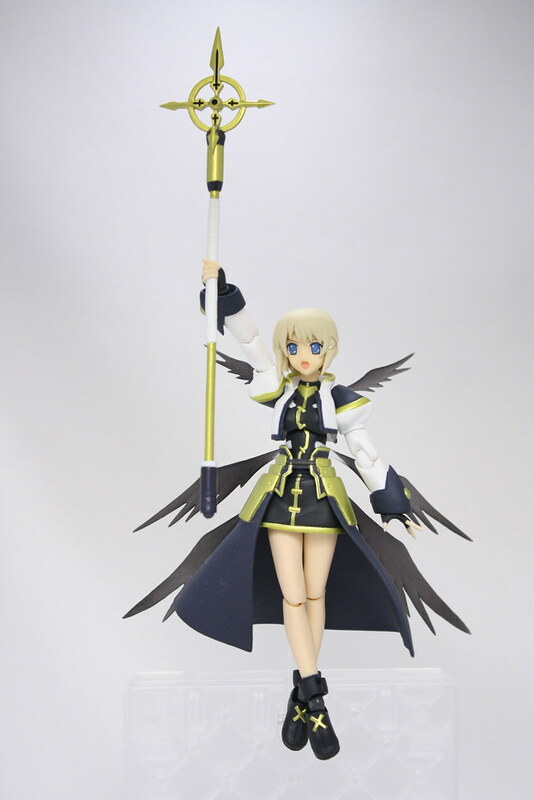 Not only does she come with bonus parts for herself, but she comes with bonus parts for her Meister, Hayate, and her bonus face can be used with the other Nanoha figmas as well! The level of detail on Klarer Wind on the bonus hands is impeccable, and the mechanism invented to keep her hat on is quite unique. 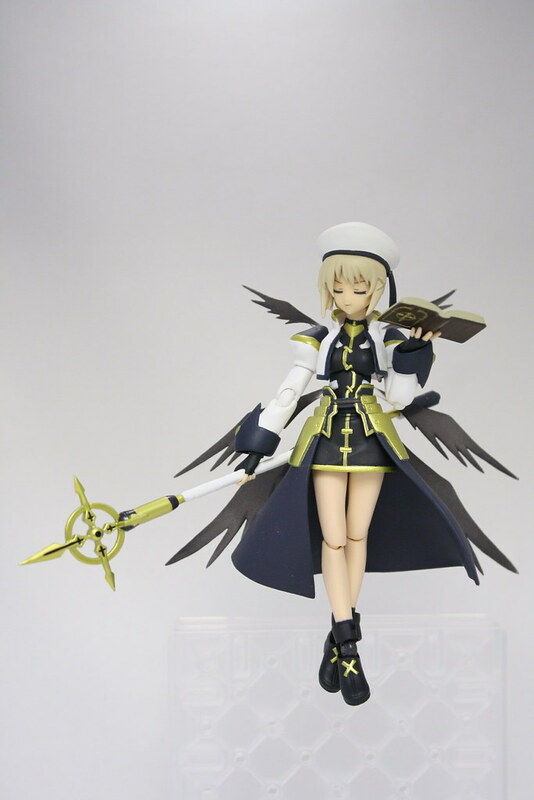 I was certainly on the fence when I heard that Shamal would be released as a figma. She doesn’t have any real weapons like Signum and Vita, so I was curious to see what kinds of accessories she would come with the compensate for this. I have to say that I am incredibly satisfied with the contents of the package I received yesterday! 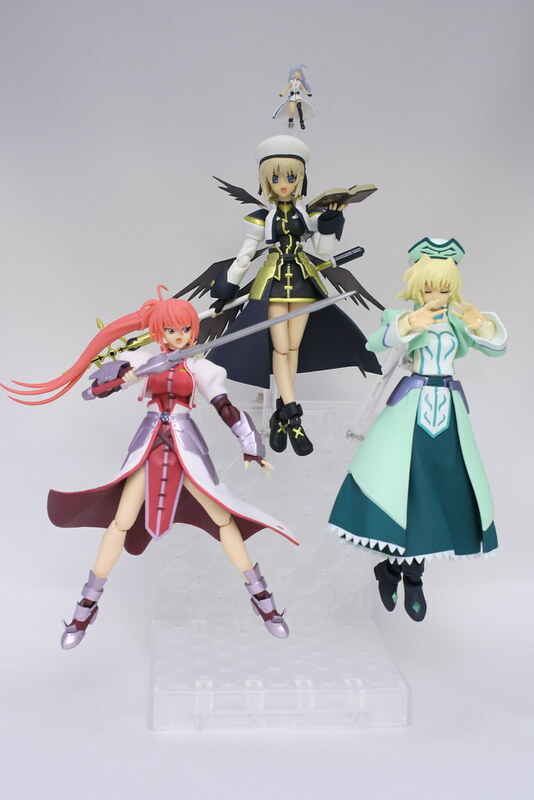 Well worth it for the Nanoha fan, definitely worth it if you already have Hayate in your collection, and a nice addition to any figma collector’s shelf. I give it 4 out of 5 Kaito thumbs up! 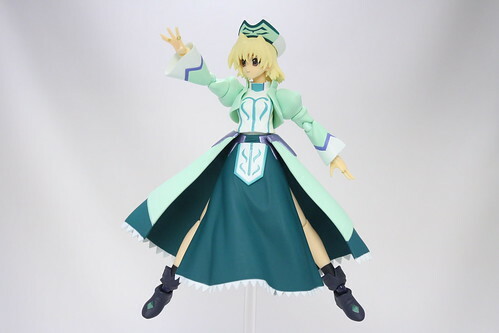 Shamal can be purchased from Hobby Search for ¥2,533 or at Hobby Link Japan for ¥2,667. I really liked how the extras of the figma of Shamal came out. This character had very little action in the third season, and I really had doubted that anyone outside of the three main girls would be figmatized. 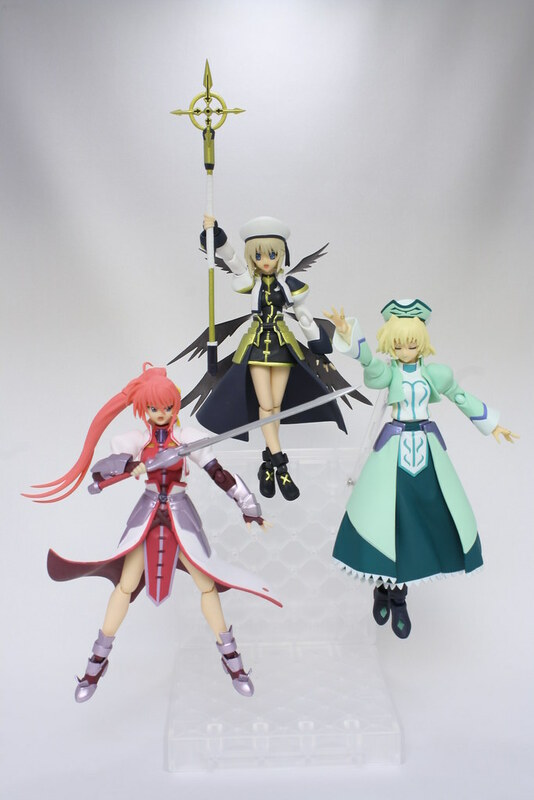 But, it seems that all of the girls from the third season would become figmas, and now I just need Subaru and Teana to complete Hayate’s 6th Mobile Division!